This unique portrait of the rarely glimpsed world beneath Britain’s lakes, rivers and seas is brought to life by renowned wildlife artist David Miller. In order to capture such stunning images David draws not only on his first-hand experiences of diving some of Britain’s most beautiful waters, from chilly, rock-strewn salmon-haunted rivers of Scotland, to the spectacular coastal waters of North Pembrokeshire, with its wealth of bird and sea-life, but also on a deep rooted reverence for and understanding of his subject. Langford Press is to be congratulated on an impressive list of wildlife art books: this is the first to concentrate on fish. Most are underwater views, painted by an artist who spends much time in a wet suit in Britain’s rivers. A few show fish as most of us just occasionally see them, from above the water. The fish tend to be nearly “perfect”….The beautiful pictures offer a glimpse into a world of a group of creatures usually sadly neglected by wildlife enthusiast. 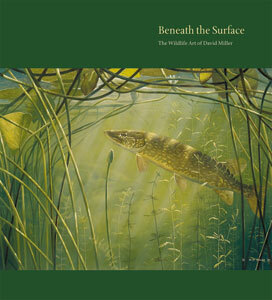 … it is with great pleasure that I opened the cover of Beneath the Surface. Inside this large -format volume are some of the most appealing paintings and line art it has ever been my privilege to review, and the quality of the reproduction is absolutely beyond reproach – be prepared for a serious treat. Langford Press have enjoyed considerable success with their ‘Wildlife Art Series’ and David Miller was an obvious choice…as a fisherman it is impossible not to appreciate this book. David is a keen angler and learnt his fish portraiture the hard way, by diving to view his subject in their natural habitat-it sounds kind of extreme, but when you compare David’s art to virtually anybody else’s, it is impossible not to be conscious of the difference, not least because most artists paint fish as they appear in the hand, rather than as they do underwater. David’s fish look as if they belong there…The plates are generous and accompanied by explanatory text and photographs; with sections on coarse, game and sea fish I don’t see how anyone could turn this down. 156 pages of some of the most stunning wildlife art to have ever graced a book…this book combines David’s love of our sport with his immense abilities as an artist….if stunning artwork accompanied by absorbing stories and explanations is what you are looking for in a book this is right up your street. Like many artists, Miller likes to get the details right and that’s clear enough in this stunning collection of paintings, sketches and photographs of fish, faithfully depicted in their habitat….The book is arranged in three sections, covering coarse, game and sea fish. Much as I love all of his work, it is the paintings of pike that stand out for me. Richard Donkin Financial Times November 24/25 2007.